It’s no secret that there are bots on Twitter. But how do bot accounts – which automatically create tweets without direct human oversight – actually affect the mix of content on Twitter? A new Pew Research Center study, conducted over a six-week period in the summer of 2017, examined 1.2 million tweets with URL links to determine what share of links were posted by bots on Twitter. The study identified bots using Botometer, which learns patterns from hand-classified account data produced by trained experts. To count how many times human and bot accounts shared links to particular websites, we wrote a computer program to follow each shared link to its destination. Then we isolated the 2,315 most commonly shared sites with meaningful content and classified the kinds of content that appear on those sites. 1 Two-thirds (66%) of all tweeted links were shared by suspected bots. This includes links to different kinds of content around the web, ranging from adult content to commercial products and even to links that redirect internally to Twitter.com. This estimate suggests that automated accounts are more prolific than human users in sharing links on Twitter. 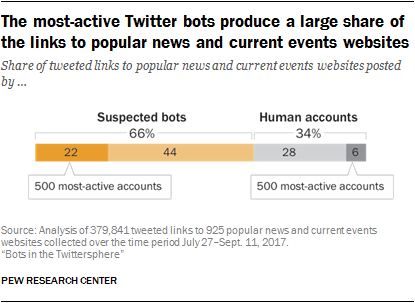 2Suspected bots also accounted for 66% of tweeted links to sites focused on news and current events. That’s a lower share than for sites focused on adult content (90%), sports (76%) and commercial products (73%), but higher than for sites focused on celebrities (62%), those focused on organizations or groups (53%) or internal links to Twitter.com (50%). News and current events websites include sites that produce original reporting on events in public life, those that mostly aggregate news from other sites, and those that focus primarily on commentary or discussion. 3 Among news and current events sites, those with political content saw the lowest proportion (57%) of bot shares. 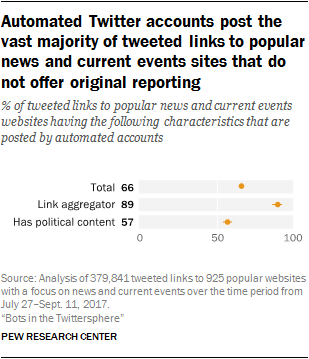 While much of the discussion surrounding bots has centered around their sharing of political content, this study finds that the proportion of automated link shares among sites featuring political content is lower than among sites not featuring political content. Suspected bots shared a little more than half of links to sites with political content – defined as sites that have a dedicated politics section on their main page or have political stories among their top headlines — but the share was 74% among sites related to news and current events that did not feature political content. 4About nine-in-ten tweeted links to popular news aggregation sites (89%) were posted by bots, not human users. This is a significantly higher share than for sites that primarily produce their own news content. These aggregation sites often feature a screenshot or posted image of a news story produced by another news outlet, as well as a description of the original reporting. 5 A small number of highly active bots were responsible for a large share of links to prominent news and media sites. We found that the 500 most active suspected bot accounts were responsible for 22% of the tweeted links to popular news and current events sites during the study period. By comparison, the 500 most active human users were responsible for a much smaller share (an estimated 6%) of tweeted links to these outlets. Note: These findings are based on an analysis of a sample of 1.2 million public tweets collected via Twitter’s streaming API between July 27 and Sept. 6, 2017, containing links to popular websites. See the report’s Methodology section for more details. Stefan Wojcik is a computational social scientist focusing on data science at Pew Research Center.